U.S. Falls to Czech, Roster Cuts to Come ~ The Bucky Channel - The World of Sports from Wisconsin's Perspective. It was a game the Americans were using solely to help them make some roster cuts before they boarded the plane to South Africa, but it was a game that you'd prefer the Americans could win to give them some momentum heading into the Cup. In the end, the Americans lost a friendly to the Czech Republic by a score of 4-2, causing some players to likely lose their bid to be on the 23-man roster that is heading overseas. Many of the U.S.'s top stars, such as Landon Donovan, Michael Bradley, and Tim Howard, were on the bench (or in the box seats) for this one, so it was basically the Amercians' reserves fighting for roster spots. 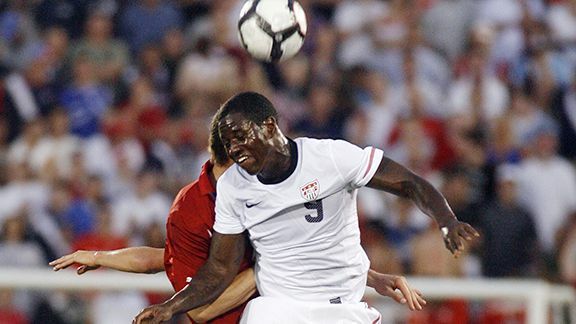 Helping their cause were Maurice Edu and Herculez Gomez, both of whom scored goals for Uncle Sam on Tuesday. Edu's spot on the team was probably secure anyway, but unless coach Bob Bradley had his lineup set in stone Gomez probably fought his way onto the team. One man who may be left out is Edson Buddle, the star of the Los Angeles Galaxy I've been pulling for to make the squad, as he struggled a bit in this one. The rosters will be announced at noon on Wednesday, and we'll make sure to have those up for you. A lot of tough decisions are going to have to be made, so here's to hoping Bradley puts together the right squad. I don't have any suggestions really as to who should make and who shouldn't, I just want Bradley to put together a team that is going to work well on the field. Find the 23 guys that will have the best possible chemistry and that will give us our best shot. The U.S. actually does have one more game stateside before they head over to Africa, and that will be against Turkey this Saturday afternoon, live on ESPN2 in Philadelphia. Gametime is at 1pm, if that is all something that interests you. After that, it's one last tune up on June 5th against Australia in South Africa, and then on June 12th - it's on baby.